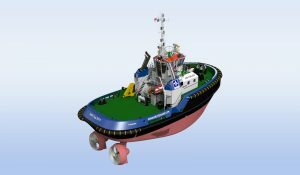 The Meyer’s Group has ordered two, powerful Damen ASD 2913 Tugs to operate in Panama. At an official signing ceremony at the Panama Maritime XIII World Conference, Michel Mittelmeyer, Chief Executive Officer said the Meyer’s Group was awarded a contract last year to offer towage support in the ports of Colon and Balboa. 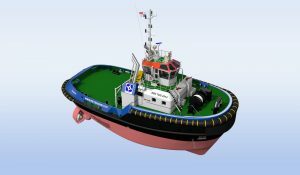 These new tugs are more powerful vessels, of at least 80 tonnes bollard pull, are needed given the ever-increasing size of vessels, adds Mr Mittelmeyer. In 2012, the Meyer’s Group bought two Damen ASD 2810 Tugs and an ASD 3212. But before this, the company had also chartered many Damen vessels. The latest two additions – Arcangel San Rafael and Arcangel San Gabriel – will join the fleet in May and August.